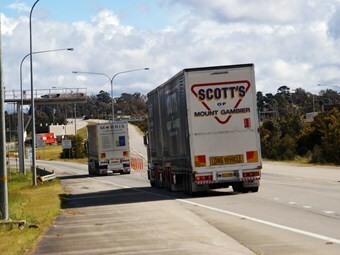 New South Wales authorities believe record chain of responsibility fines on Scott’s Transport serve to reinforce the State’s hard line on compliance. The Local Court of NSW recently fined the Mount Gambier-based heavy vehicle operator more than $1.25 million for speeding and speed limiter offences after the company and director Ray Scott and group general manager Peter Anderson pleaded guilty to 165 speeding offences and a further speed limiter compliance offence with a highest recorded speed of 142 km/h. The magistrate found Scott’s policies and procedures to govern the speed management of drivers "were inadequate to prevent drivers from exceeding the speed limit". NSW sees the outcome as a significant boost towards increasing compliance in the industry. "Pursuing these offences reflects Roads and Maritime Services’ ongoing concern about heavy vehicle speeding and strengthens the agency’s determination to do everything possible to eradicate this type of behaviour from NSW roads," a spokesman for NSW Roads and Maritime Service, which was awarded costs of $100,000, says. "This sends a clear message – speeding above 100km/h in a heavy vehicle is a highly dangerous and illegal practice. "Any remaining companies including their customers, packers and consignees involved in high end speeding and speed limiter tampering should expect to face significant fines, which reflect the degree of community concern on this issue. "Chain of Responsibility laws apply to all parties in the supply chain who are responsible for preventing offences. "To date there have been more than 4,250 Chain of Responsibility charges – 262 in the past year alone." Of practices at Scott’s at the time, the magistrate found fault with the Driver Induction and Training Handbook, which Anderson should have realised was deficient. "I regard the manual as it relates to speeding to be very inadequate and unlikely to be read, understood or acted upon by a driver, due to the sheer volume of material, that lack of emphasis and the inappropriate style," he states. He also took issue with the lack of action when speeding offences, mostly along the Hume Highway, were brought to the company’s attention. Despite the severity of the sentence, there were some silver linings for the company. "The offenders have shown through the improvements made to Scott’s to speed compliance measures that they have excellent prospects of rehabilitation, and it is unlikely they will re-offend," the magistrate states. The agreed statement of facts noted Anderson, a Victorian Transport Association board member who was backed by board executive director Phil Lovel as a "strong advocate for safety", had had limited time to address shortcomings but had made "substantial improvements to address driver speeding". "To some extent, Mr Anderson was in the wrong place at the wrong time," the ruling says. The findings noted that Anderson had brought in Group Safety and Compliance Manager Shane Falkiner, who had held a similar position at Linfox, where he had managed the installation of GPS fleet tracking systems, on December 3, 2012, and that there had been efforts previously to tackle speeding. It also noted that Scott was not in a managerial role, had understandably assumed speeding was being addressed, and had sought to tackle the issue. Among related cases, the judgement noted that previous group general manager Bruce Grubb had been fined in an earlier case. Another trucking firm caught at around the same time as the crackdown that led to the Scott’s prosecution, Damorange, had been fined $50,000 and ordered to pay $52,000 in costs for 240 offences. The case of Logistics 1 saw the company and two of its officers fined $220,000 and ordered to pay $35,000 in costs.